We first met Paul & Lois Carlson about 1956-57, when we moved to Torrance, CA. We were driving to L. A. to attend the Covenant Church, when we were introduced to folks living in our neighborhood who had hopes to plant a new Covenant church. We found there were quite a few of us looking for a church closer to home, and we began meeting in homes and praying about when and how this could happen. This is the group where we first met Paul and Lois. Lois was eager for friendship, with Paul in the middle of a strenuous surgical residency. There is a lot of story in between but we became good friends, and Rolling Hills Covenant Church was born. I particularly remember a conversation with Lois when Paul had gone to Congo on a short trip, after Belgium doctors had left and the need was so great. I think Lois knew at the time what was ahead but was struggling with the thought of joining what she thought was the leading of God for Paul. I think it was when Paul returned from the stent in Congo, that he was elected church chairman and led well. The men would fix breakfast on Saturday mornings and pray. He led the church in a “100 days of preparation” program while we were waiting for our next pastor. 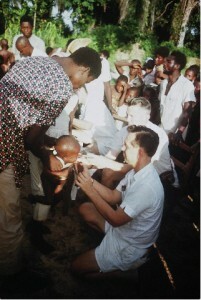 Then Paul got the invitation from the church in Congo to please return with his family. I recently found in a drawer a letter that Lois had written to us from Congo, on November 7, l963. It is a two page letter on a thin airmail type paper. She was excited about all the news from the church that was now flourishing. She talked about the Circle projects of the baby sacques and blankets that were so badly needed, wishing she had some ladies to patch the hospital mattresses, and trying to settle in their home that had been empty for 3 yrs. that needed curtains/drapes with Jody LeVahn’s treadle sewing machine. We (RHCC) were sorry to see them leave, but it was our privilege to send our second missionary family off for service that year. During Paul’s captivity, the church prayed so hard for his release, but that didn’t happen and it was a severe disappointment for us all. We had to trust God’s Sovereignty in all matters. Lois and the children returned to live in our area for a period of time before she moved to San Diego, but we still keep in touch and I consider her a dear friend.